Wanted to share with you the new weekly deals and tell you a little bit about them. These deals are good only until August 3. Black 3/8″ Satin Ribbon – I LOVE this ribbon! I’m so glad we have it in black. It’s the same ribbon we had last year in the 2014-2016 In Colors. Happy Patterns Decorative Masks -Easy to use, Great on cards, bags, gift wrap, and banners! Hearts Border punch – great price! Love this punch. 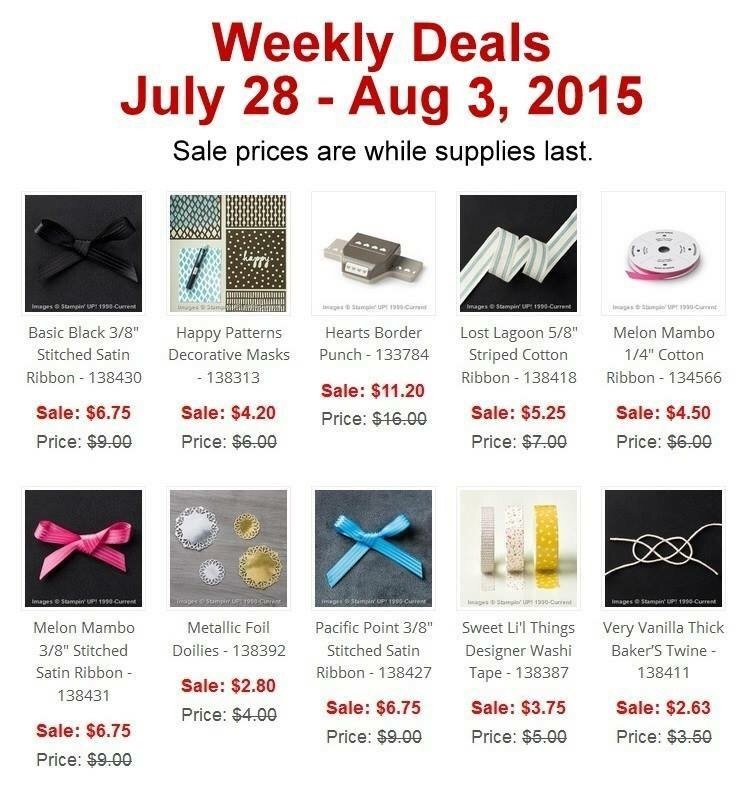 Lost Lagoon Striped Cotton ribbon – This is the week to stock up on ribbon! Another great deal on my favorite 2014-2016 In Color! Remember last Holiday season? Used this color A lot! Melon Mambo 1/4″ Cotton ribbon – A great color! Love this ribbon, easy to use whether you use a knot or a bow. Melon Mambo 3/8″ Satin Ribbon – if you don’t get the 1/4″ cotton ribbon – get this one! As I mentioned before, I love this ribbon. Metallic Foil Doilies – this is the MUST buy on this week’s deals! These doilies are metallic on one side and flat white on the other – so if you want to color with a stamp pad, it is super easy to do! Pacific Point 3/8″ Satin Ribbon – have you heard that I love this ribbon? Have you seen the texture? Sweet Lil Things Designer Washi Tape – Washi Tape is easy to use. Great accent. Inexpensive. Great colors. Very Vanilla Thick Baker’s twine – super cheap and again so very easy to use. Color it with a spritzer or stamp pad. Remember that these deals are while supplies last so you need to order early. You can order online or give me a call/email and I will be glad to help you. And for those of you who got the postcard invitation to my customer appreciation party please RSVP if you’re coming as I need to order something and want to make sure I have enough for everyone thanks so much!